It was surreal to see Yvonne and Dennis again after befriending them while hiking Colca Canyon in Peru. They were so kind to welcome us into their home and even offered us to stay as long as we liked. We caught up with Dennis over tea. He shared some delicious Dutch treats with us that they had bought for our visit. They introduced us to stroopwaffles and Dutch licorice candy. Stroopwaffles are delicious, chewy syrup filled cookies that definitely need to become a staple in my diet! When Yvonne returned home they fed us a traditional home cooked Dutch meal. It consisted of mashed potatoes mixed with bacon and kale and a sausage on top. They said it was like Dutch comfort food- a farmers dish. It was amazing! We were so impressed. They are seriously great cooks. During dinner we talked with them for awhile about the rest of their time in South America and their upcoming trip to Japan. We woke up the next morning and enjoyed breakfast with Yvonne. 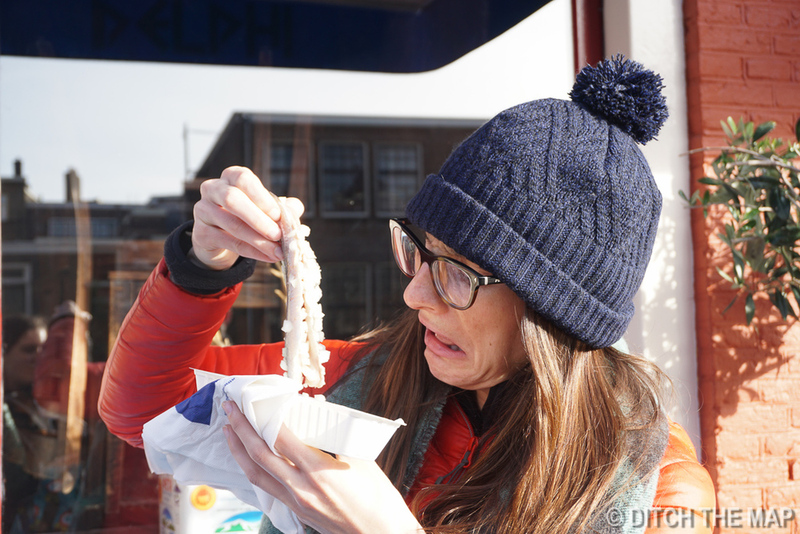 We tried hagelslag for the first time. Hagelslag is a child's fantasy food- chocolate sprinkles oftentimes poured on top of buttered toast. After breakfast we headed out to mail our ridiculously heavy box of beer. We were both anxious to get rid of it and not have to look at it or carry it again! Because the box was so heavy we decided to separate it into two smaller packages. At the post office we wrapped our boxes with even more tape, filled out customs forms (it's not alcohol, we promise. Its collectible glassware), and paid the seriously expensive shipping charge. We were willing to pay for the convenience of not having to lug the box to Germany, where it would have cost half as much. We will no longer be haunted by the heavy box of beer! Our fingers are crossed that it makes it home without breaking or getting stopped by customs. After sending the box away, we drove to a farm not too far away to try Dutch pancakes and admire some Dutch country side. Leiden has a unique location as a 20 minute drive can take you to the city or to the country. We rode by flat green farm land and arrived at the small farm. 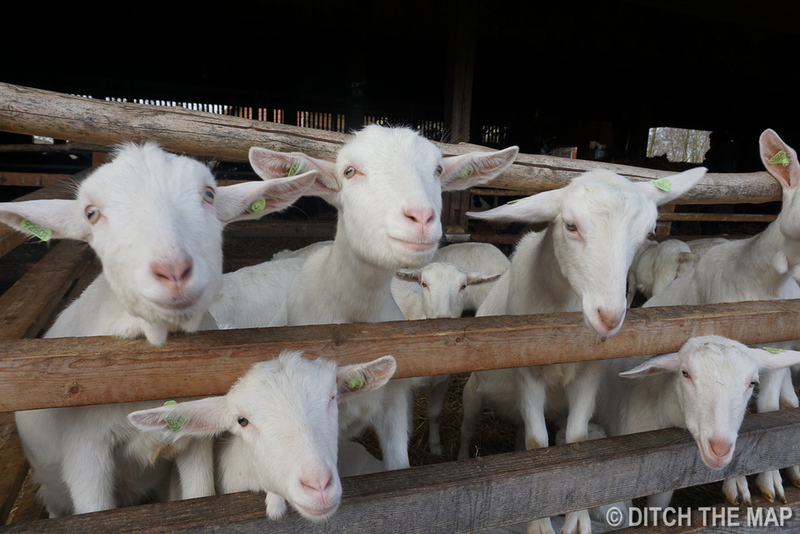 We walked among goats, cows, pigs, and a stray peacock then sat down in the farm's restaurant to try Dutch pancakes. We ordered our pancakes with cheese and bacon--Dutch pancakes can come with sweet toppings as well. The pancakes we had were smaller than traditional Dutch pancakes, which are enormous! For us these smaller pancakes were just the right size and so tasty with a bit of syrup. They are different than American pancakes--not as sweet or puffy, similar to a crepe. From the farm we drove to the city, The Hague. We explored The Hague with Yvonne as our tour guide. She showed us Chinatown, several government buildings and the Esher museum. We really enjoyed the artwork at the Esher museum. His background as a mathematician is quite apparent in his work with his use of tesselations. We learned that much of his work was done using ink on a wood carving and creating an impression on paper. His paintings have many optical illusions that are fun to look out for. Back at Dennis and Yvonne's apartment we looked through some of the books they've made about their travels. They are very well traveled both together and independently. It was inspiring to see their pictures and it got us excited for our trip to India and Asia. Before heading out for dinner Yvonne and Dennis entertained us with an awesome video game. They have a pretty extensive board game collection too. The video game was way cooler than I remember video games being as a kid. It actually had an interesting story line. Playing the game was like watching a movie but controlling what would happen next through the choices you made. To get to dinner, in true Dutch style, we biked. But, seeing as Scott and I did not have a bike, Dennis and Yvonne kindly offered us a ride on the back of their bikes. We had delicious Thai food that Dennis and Yvonne says tastes very authentic after their experience traveling in Thailand. After dinner they took us on a brief walk around Leiden to see the town. Lit up at night with its canals and cobble stone walking paths, Leiden looked beautiful. Back at their apartment we shared coffee and the best chocolate bar we've ever tasted! It's a Dutch company called Tony's Chocolonely and it is exceptional chocolate. I hope we can find it back in the states. Yvonne also had us try a Dutch eggnog type drink called Advocaat It was very rich and almost like a pudding. I really enjoyed it. Tony's Chocolonely, the chocolate bar ever! Yvonne and Dennis shared their love of escape rooms with us by treating us to an experience at a Rembrandt themed escape room in Leiden. We had both been to escape rooms in the states before and were excited to try one abroad. The escape room was able to accommodate us and make everything in english. The location of the escape room was in an old small tower that was once part of the city wall. The game took place in one room on the second floor and we had to follow clues to find Rembrandt's golden pencil. Rembrandt had actually stayed at the tower and worked on pairings there any years ago. We worked together and escaped the room in less than the allotted hour. The woman working there said we were only the 5th group to escape without any clues (out of over 750) and she complimented us saying we made a good team and worked well together. From the escape room we walked to an open air weekend market where we tried some fried fish, traditional herring and a Dutch cookie. We checked out an old fortress as well just a short climb of stairs from the market. Yvonne and Dennis were so sweet to provide us with a true Dutch experience with lots of delicious Dutch food. They were the most thoughtful hosts and so kind and generous. We hope they visit the states so we can return the favor! We took the train to Amsterdam to visit an old friend of Scott's, Kim. We arrived later in the afternoon and met Kim in her amazing spacious apartment overlooking a park. We walked around her neighborhood, had a bite to eat and bought some groceries for dinner. Later we shared dinner with Kim and her boyfriend Oliver. The following day Kim was our tour guide in Amsterdam. We walked from her apartment into the city, about 3 miles. She showed us cool markets and some streets where the houses were actually crooked because of the settling foundations. On Monday both Kim and Oliver had work and we took the day to relax in their beautiful apartment and watch movies!